The Perceptual Computing Laboratory at Waseda University is seeking several spring research interns starting from February 2019 (the schedule is negotiable), who will work on an incremental and adaptive spoken dialogue system enabling a whole new way of information creation, distribution and consumption for the coming decades. Conversational information processing is essentially different from other existing conventional interactive media, such as web services. Such conversational media require users’ explicit and implicit “pull” and “push” requests to retrieve a certain amount of information in natural ways. A long article on Wikipedia, for example, is not optimized for information consumption when using a conversational user interface – such written documents need to be fragmented and translated into spoken forms as pre-compiled utterance plans, which should be properly controlled on-the-fly when being consumed. Herein, we propose a spoken dialogue system enabling various intention levels of information seeking behaviors. The proposed system largely consists of an utterance planner and a dialogue manager. Given a set of news articles, the utterance planner pre-compiles an utterance plan that consists of a primary plan for delivering main news content, and the associated subsidiary plans for supplementing the main content. 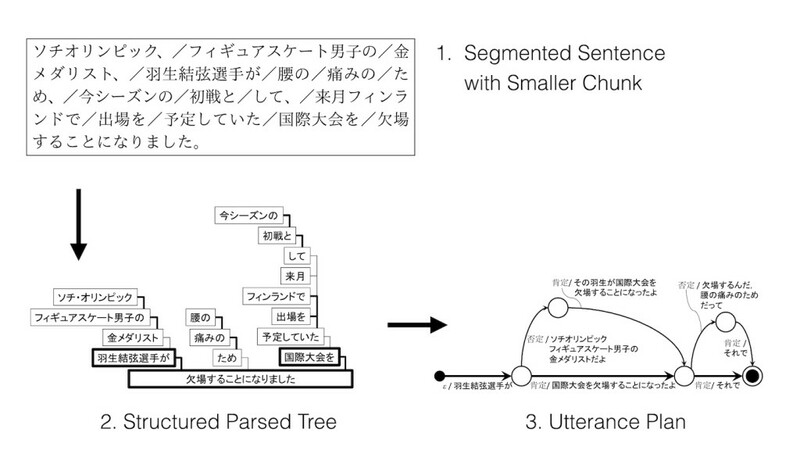 A primary plan is automatically generated by applying text summarization and style conversion techniques. The subsidiary plans are compiled by considering potential user/system interactions. With the utterance plans, the dialogue manager first classified user’s possible passive/active behaviors, and then selects the corresponding utterances. We empirically confirmed that our system was able to deliver the news content smoothly while dynamically adapting to the change of user’s intention levels. The interns also can explore new functionalities towards natural conversational experience with his/her own ideas. The completed work is expected to be published at major conferences and journals, such as ACL, SIGDIAL, IEEE/ACM Transactions on Audio, Speech, and Language Processing. The interns will be able to get intensive advice and guidance from multiple faculty mentors in the group with multiple backgrounds (machine learning, speech and language processing, and dialogue systems). Although the original reference system was implemented in Japanese, the mentors will provide the interns necessary information in English. Basic allowance, transportation and accommodation expenses: basic supports according to the regulation of Waseda University. Perceptual Computing Laboratory at Waseda University, led by professor Tetsunori Kobayashi, investigates theoretical machine learning and pattern recognition and their integrated applications, such as conversational robots and intelligent interfaces, as well as their development paradigms. The group consists of more than 10 faculty members (professors, associate and assistant professors) who have strong backgrounds of machine learning, pattern recognition, natural language processing, dialogue systems, human-robot interactions, Internet of Things, crowd-sourcing. Waseda University is a private, independent research university in central Tokyo. Since 1882, Waseda has tirelessly challenged convention, in favor of progress and innovation. Waseda is particularly famous as an international student-friendly university hosting the largest number of foreign students in Japan.